This extraordinarily ornate chapel, part of the church of Santo Domingo, is one of the highlights of 18th-century architecture in Quito, Ecuador. 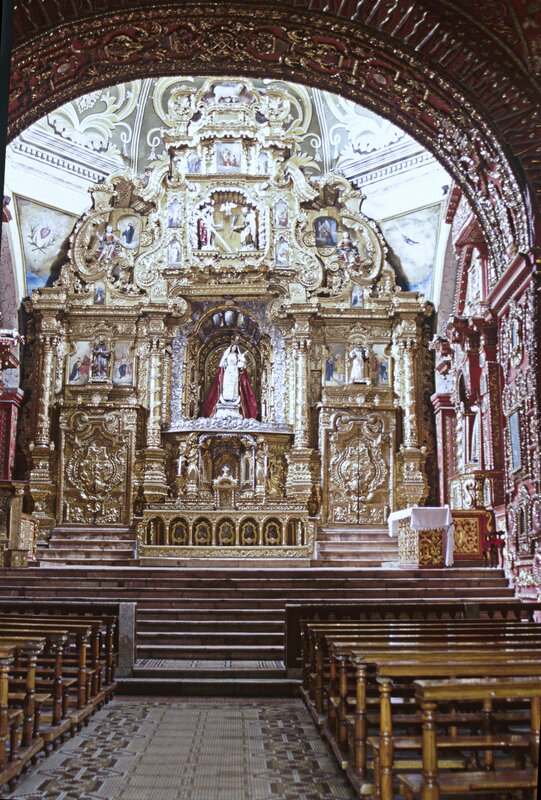 This extraordinary retable (retablo) exists in a three-dimensional space and emphasizes complex architectural forms, which were carefully gilded. 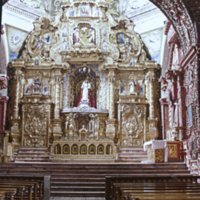 It contrasts with retablos in other regions that emphasize the large sculptures of saints, or include more figural and narrative paintings, and are set flush against a flat wall. The central object of devotion here is a statue of Mary, shown as Our Lady of the Rosary. Quito was an important center for the production of carved wooden sculptures like this one. To enhance the theatrical effects of the retablo, windows in the dome over the chapel allow light to pour down on the gilded altar, in striking contrast to the dimly-lit nave. Mirrors set towards the back of the central niche reflect and multiply the Virgin’s image. This chapel was commissioned by the Spanish branch of the cofradía of Our Lady of the Rosary, whose members included some of the wealthiest men in Quito. Much of the chapel’s sculpture was created by or under the direction of the sculptor Bernardo de Legarda, himself a cofradía member. The elaborate interior decorations of the chapel, seen in this photograph, are made of painted and gilded stucco. Most of the retable (retablo) is carved wood, covered in gold leaf. The dense coating of sculptural decoration transforms the chapel’s interior into an exuberant environment. To build this chapel, the Dominicans created an extension of their 16th-century church in Quito to bridge an adjacent street. The chapel thus indicates how church architecture reshaped the civic space of urban centers. Our Lady of the Rosary, a manifestation of the Virgin promoted by Dominicans worldwide, was enthusiastically embraced across Quito’s social classes. The cofradía devoted to her was divided into different branches (ramos) along ethnic boundaries. By the middle of the 17th century, within Santo Domingo, Our Lady of the Rosary had four separate chapels paid for, and maintained by, cofradías of mulatos y negros (biracial and black people), morenos (biracial people, but probably lighter skinned than mulatos), Spaniards and naturales (native Andeans). All members of the cofradía would join to celebrate Our Lady’s feast days, one during Holy Week, and the other in October. Thus, cofradías, and the collective devotion they entailed, reinforced the common values of Quiteño society, at the same time they upheld and inscribed social difference. Kennedy, Alexandra. 2002. Arte de la real Audiencia de Quito, siglos XVII-XIX. Hondarribia, Spain: Editorial Nerea. Terán Najas, Rosemarie. 1994. Arte, espacio y religiosidad en el convento de Santo Domingo. Quito: Ediciones Libri Mundi. Webster, Susan Verdi. 2009. "Masters of the Trade: Native Artisans, Guilds and the Construction of Colonial Quito." Journal of the Society of Architectural Historians 68 (1): 10-29.